Rich recently blogged about the limitations of the two-atom bond representation often used in chemoinformatics, triggered by the four ferrocene entries in PubChem. In reply to himself, Rich described FlexMol, an XML language that can describe bond systems that involve more than two atoms. Obviously, the problems originates from the lack of mathematical knowledge of chemists: the current chemoinformatics heavily depends on graph theory, where each atom is a vertex and each bond an edge. This has the advantage that we can borrow all algorithms that work with graph representations, such as Dijkstra's algorithm to find the shortest path between two vertices. Or, in chemical language, an algorithm to calculate how many bonds two atoms are apart in a molecule. When discussing FlexMol, Rich mentions the work by Dietz (DOI:10.1021/ci00027a001), but I would like to mention the PhD thesis of S. Bauerschmidt to this (see DOI: 10.1021/ci9704423) done in Gasteiger's group. Dropping this 'two-atom bond' representation in favor of something that better describes compounds like ferrocene, like the Dietz and Bauerschmidt approaches, has the unfortunate disadvantage of loosing compatibility with graph theory algorithms. Nevertheless, in order to take chemoinformatics to the next level, we have to address these issues. But hope is not lost, and people are working on rewriting our toolkit of chemoinformatics algorithms to match such new representations. In will postpone analyzing the CDK for compatibility with such more modern representations (look out for a CDK News article), and now just describe how the CDK can be used for FlexMol/Dietz/Bauerschmidt representations. Consider the four examples Rich gives in his blog. Here are the CDK ways of doing the same. one with 6 electrons, and 6 associated atoms. Here's a quick update on my blog about SMILES, CAS and InChI in blogs: Greasemonkey last sunday. The original download was messed up :( You can download a new version at userscripts.org. The current script only adds search links to PubChem and Google, but the possibilities are endless, and potentially very powerfull. Here are some future ideas. This would involve some more work, but this most certainly possible too, given that we actually have a website around which allows downloading 3D coordinates given a SMILES or InChI. While a simple approach would be to make a popup with Jmol that takes the URL to that 3D coordinate website, it could be extended using Ajax to query the 3D structure first, and depending on success, show Jmol or a message "Could not find 3D coordinates". This is likely the most exiting possibility. I blogged about CMLRSS many times now (check the AVI, the article, etc), and combining these two technologies will take the semantic, chemistry internet to the next level. CMLRSS describes how CML can be embedded in blog items (e.g. 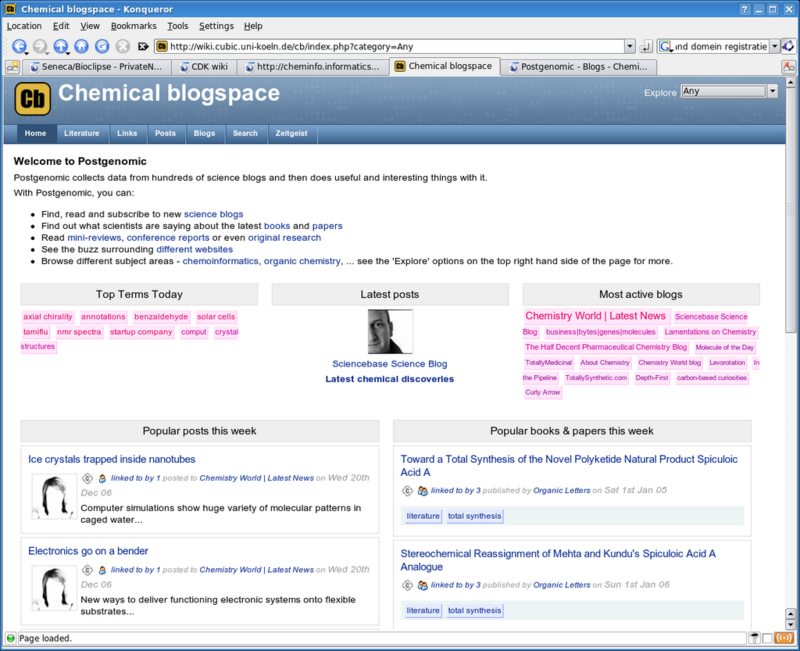 Blogging chemistry on blogspot.com), but really works for any XHTML. Consider this mockup: add CML content to your blog item, containing molecular properties, such as it's NMR peaks, elemental analysis, etc. This will not show up in your blog item, so that the user is not bothered with implementation details. Now, a userscript will now about the CML content, as it has access to the whole content of the page. The visible text will mention the molecule for which CML contains experimental or other details. Using the <span class="chem:compound"/> technology shown above, it is possible to link that compound to this CML bit (details to follow in this blog in January 2007). The userscript will then on the fly create a popup for the compound name in the visible text to show those experimental details. How about that? Comments and other ideas are more than welcome! We all know the combinatorial explosion when calculating the number of possible constitutional isomers (see wp:structural isomorphism) of a certain molecular formula. For example, C2H6 has only one constitutional isomer (ethane, InChI=1/C2H6/c1-2/h1-2H3), and C4H10 has only two. Especially, breaking symmetry by replacing one carbon by another element, or replacing a single by a double bond, increases the number sharply. For example, C7H16 has only nine constitutional isomers, while replacing two single bonds by two double bonds, creating C7H10, increases this number to 499! 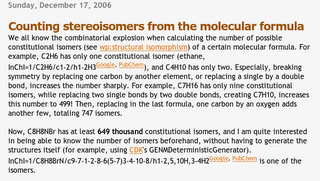 Then, replacing in the last formula, one carbon by an oxygen adds another few, totaling 747 isomers. 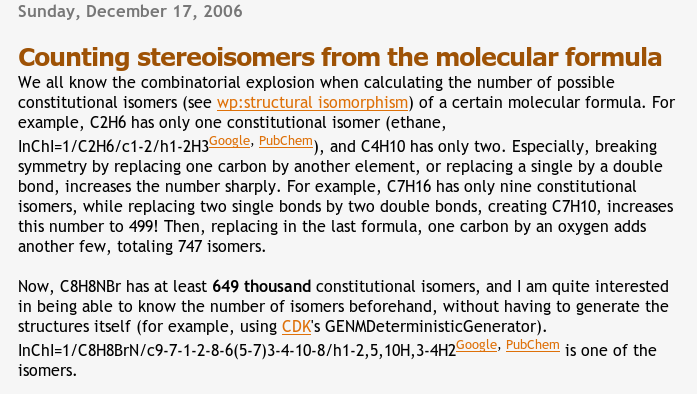 Now, C8H8NBr has at least 649 thousand constitutional isomers, and I am quite interested in being able to know the number of isomers beforehand, without having to generate the structures itself (for example, using CDK's GENMDeterministicGenerator). InChI=1/C8H8BrN/c9-7-1-2-8-6(5-7)3-4-10-8/h1-2,5,10H,3-4H2 is one of the isomers. Additionally, any relevant, recent literature recommendations are most welcomed. I am aware of the use of polynomials, but literature I have seen so far just focuses on molecules of a certain architecture, and it not able to come up with a guess based on the molecular formula alone. 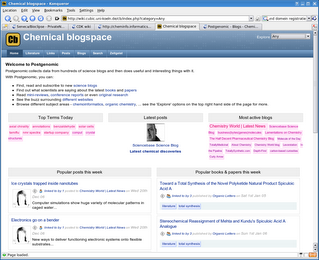 The blogs ChemBark and KinasePro have been discussing the use of SMILES, CML and InChI in Chemical Blogspace (with 70 chemistry blogs now!). Chemists seem to prefer SMILES over InChI, while there is interest in moving towards CML too. Peter commented. Any incorporation of content other than images and free text requires some HTML knowledge, but this can be rather limited. It is up to us chemoinformaticians to write good documentation on how to do things; so here is a first go. I blogged about including CML in blogs last February, and can generally refer to this article published last year: Chemical markup, XML, and the World Wide Web. 5. Applications of chemical metadata in RSS aggregators (PMID:15032525, DOI:10.1021/ci034244p). Basically, it just comes down to putting the CML code into the HTML version of your blog content, though I appreciate the need for plugins. Including SMILES is much easier as it is plain text, and has the advantage over InChI that it is much more readable. Chris wondered in th e KinasePro blog on how to tag SMILES, while Paul did the same on ChemBark about CAS numbers. Now, users of PostGenomic.com know how to add markup to their blogs to get PostGenomic index discussed literature, website and conferences. Something similar is easily done for chemistry things too, as I showed in Hacking InChI support into postgenomic.com (which was put on lower priority because of finishing my PhD). PostGenomic.com basically uses microformats, which I blogged about just a few days ago in Chemo::Blogs #2, where I suggested the use of <span class="chemicalcompound">asperin. which requires you to register the namespace xmlns:chem="http://www.blueobelisk.org/chemistryblogs/" somewhere though. Formally, the URN for this namespace needs to be formalized; Peter, would the Blue Obelisk be the platform to do this? BTW, this is more advanced, and currently does not have practical advantages over the use of microformats. Peter blogged about the h-index, which is a measure for ones scientific impact. He used Google Scholar, but I do not feel that that database is clean enough. I believe a better source would be the ISI Web-of-Science. Of course, there are many comments on this. Like any measurement, take into account the error. Sources of error include, but are not limited to, ambiguity in the query. The most notable example of this, I think, is Andreas Bender; I don't think he has been that successful :) Also, Rajarshi Guha's h-index was reported 6, but the list included two articles from the 70-ies and 80-ies, which I do not think are actually really his. Feel free to suggest other names, query corrections, tips, and I will add or work on those too. Because no one picked up my Chemo::Blogs suggestion, I will now officially claim the blog series title. However, unlike the original Bio::Blogs series, I will not summarize interesting blogs, but just spam you with websites I recently marked as toblog on del.icio.us. There are a few new chemistry blogs I want to mention (and already added to Chemical blogspace): ChemBark, lirico which has an interesting chemoinformatics section, and The Curious Wavefunction. Worth reading indeed. Pierre's YOKOFAKUN deserves a paragraph of his own. He recently blogged about bio2rdf which provides an RDF interface to biochemical knowledge via Life Science Identifiers (LSID), OBOEdit which is a Java based ontology editor, and Amadea which is a Taverna and KNIME like tool for setting up UNIX pipes. A few EMBL PhD students are having the First Online EMBL PhD Symposium (catchy name, or ... ;) Anyway, discussions are held on IRC, and it has a rather interesting Web2.0 session. All media is available on the website but requires registration right now. After the conference it will become open access to all. Jean-Claude contributed The UsefulChem Project: Open Source Chemistry Research using Blogs and Wikis to the Participants' Contributions section, and I did have a poster on Distributing molecular information over the Internet, discussing CMLRSS, blog aggregators, CML and other things. The IRC session was logged and is available here. Finally, I want to mention three recent articles. First one is a recent write up by Bourne and Friedberg about Ten Simple Rules for Selecting a Postdoctoral Position (DOI: 10.1371/journal.pcbi.0020121). With the end of my current postdoc position nearing, rather useful reading. Some time ago I blogged about a New open access journal Source Code for Biology and Medicine, and the journal is now up and running. Details can be read in the first editorial (DOI: 10.1186/1751-0473-1-1). The third article I would like to mention is Scientific Software Development Is Not an Oxymoron by Baxter (DOI: 10.1371/journal.pcbi.0020087), though I do not think it has new insights. Contributions to open data do not have to be large, as long as many people are doing it. The Wikipedia is a good example, and PubChem accepts contributions of small databases too (I think). The result can still be large and rather useful, even scientifically. If all chemists and biochemists would add information about or properties of one molecule or metabolite to the Wikipedia each month, one or more commercial database companies will have to change their business model soon. Oh, you already can start doing this here.